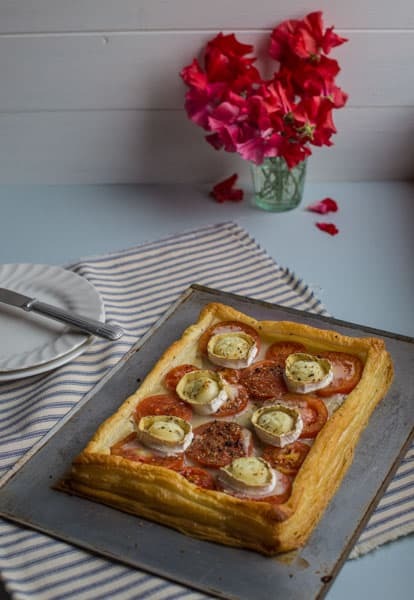 This impressive Tomato and Goats Cheese Tart is a whizz to knock up and can be on the table within 30 minutes. You know there are some recipes in this world that are mind-blowingly tasty, yet are so stoopidly quick ‘n’ easy to make that you’re almost a bit embarrassed when people ask how you made it? This my friends, is one of those. You can have it on the table within 30 minutes. It looks, smells and most importantly tastes fabulous. And all you really need to accompany it is a basic green salad and a bottle of chilled white. Unroll the pastry and lay out on a baking sheet. If you don't have a baking sheet large enough for it to fit on, cut it in half and make two tarts. Using a small sharp knife, score about an inch in from the side of the pastry. You don't want to cut right through it, but cut through about 75% of the pastry's layers. Next use a fork to gently stab the pastry all over within the score line and then spread the mustard out again within the scored area. Slice the tomatoes and cheese to about half an inch thick and cover the centre of the tart. Sprinkle a little dried oregano and black pepper over the top and bake for around 20 minutes, or until the edges have puffed up and turned golden and the goats cheese has melted. It has to be the simplest dish out there, yet so tasty! I hope you love it. 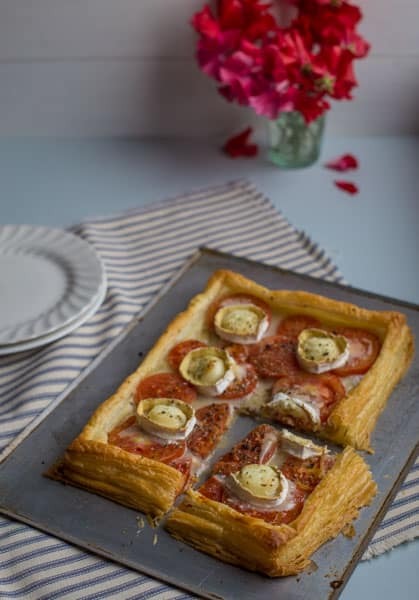 This tart looks delicious, perfect for lunch with salad. This is one of my favourites too Janie, although I tend to spread mine with pesto. I’ll have to try it with mustard too. Stumbled, pinned and tweeted. As Jacqueline says I would love to make this and smother it with some pesto. 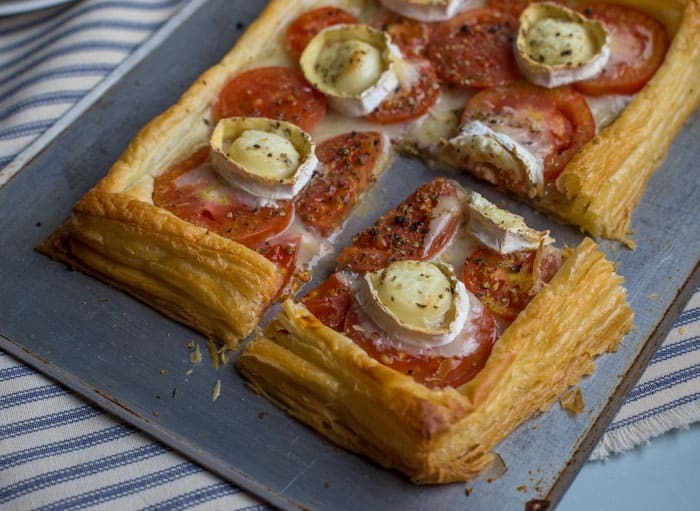 This looks wonderful and I am seriously craving goat’s cheese and puff pastry now!